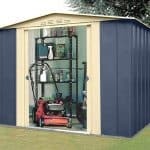 Life would be dull if everything looked the same, so we really like this good sized metal shed that stands out from its competitors. The blue colour scheme is subtle and attractive, and more than that it’s very well applied which gives an indication of the attention to detail that the manufacturers have taken. Another advantage of the paintwork, of course, is that it gives an added layer of protection against the rain, always an essential consideration when it comes to metal sheds. This is aided by the apex roof at its summit, and by the high quality galvanised cladding utilised across the shed as a whole. It not only toughens the structure, ensuring that it remains stable in strong winds, it also makes it very hard for rain to get into the substrate and cause rust. With a 20 year warranty to back this up, it’s reassurance that the shed will stay looking great for decades to come. 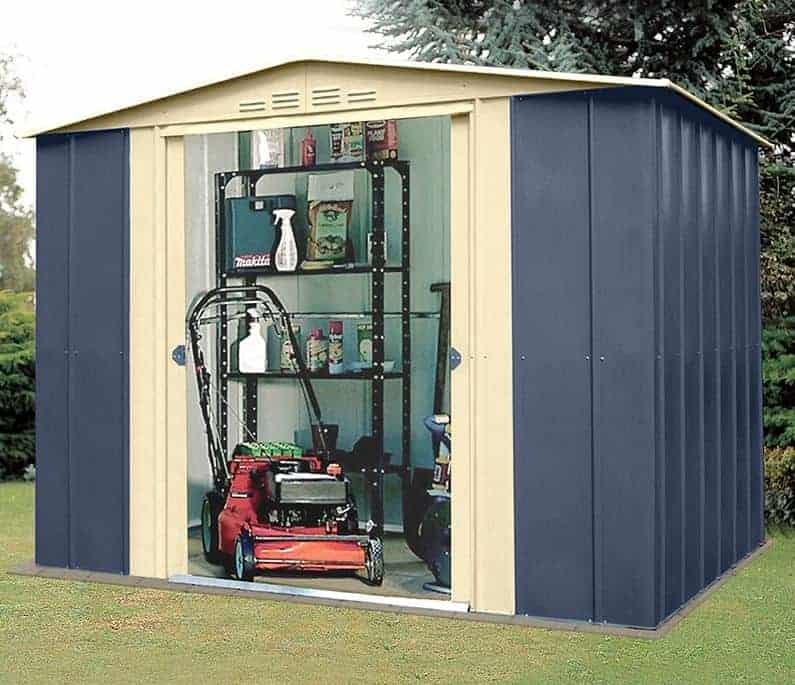 Its mid size footprint means that this is suitable for gardens of all sizes, and we were surprised at just how much we could fit inside thanks to the extra headroom this shed has when compared to many others in the same price range. With the addition of a padlock, which unfortunately isn’t included as standard, this could be an ideal place to store garden tools or even bicycles and other larger objects. 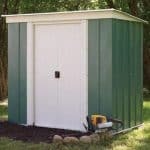 This apex roofed metal storage shed is markedly distinct from most that you’ll see in ubiquitous silver or green. We really like the contrasting blue and cream colour scheme, and think that it will add a stylish touch to any garden, traditional or modern. The interior is painted too, but in a white colour so that any light coming into the shed is magnified. We were pleased to see that an apex roof sits atop the shed, as they are highly effective at keeping water out of the sheds interior. They also, of course, add a little more room for the storage of taller items and for walking around in. The ridge height is 1.98m, and as the pitch is relatively shallow the eaves height is an accommodating 1.78m. When choosing a level concrete area on which to site the shed, keep in mind the overall width of 2.33m and the overall depth of 1.75m. During assembly we could feel how light the cladding is, and it was thin and easy to lift and manipulate, yet it was also slightly thicker than the cladding used on some other metal sheds in the Shed Baron Grandale range. The measured thickness is 0.30mm, and this includes the hot dipped galvanised coating on top of the steel core itself. The frame is made of the same material, as is the roof and gables, but is around twice the thickness of the cladding. It’s this that helps give the shed real rigidity and stability when screwed and bolted together. 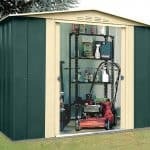 There is no floor as the shed is designed to be affixed directly onto pre-existing concrete, but we would still have preferred an anchor kit to be included. As it is, the customer will have to purchase a set of expansion screws with which to fasten the shed to its base. 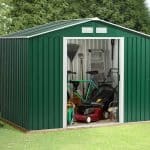 Metal sheds hold many advantages over wooden sheds, one of which is that they require no annual maintenance in the way that timber does, thus saving time and money. If rust takes hold, however, what was once beautiful can become unsightly, which is why we were happy to find that the manufacturer has provided a long 20 year warranty against perforations appearing that have been caused by dust. It’s twice as long as the warranty on many metal sheds we review, so is in itself a mark of the quality of the cladding used. The double sliding doors stood out for us, not only for the attractive contrast they make with their blue surrounds. Fitted internally they are protected from the elements and impacts, and they felt strong and secure when in operation; it was noticeable that they are made of thicker steel than that used in the rest of the shed, which is always a welcome feature. They are also more generously proportioned than many doors we see, with a width of 1.04m and a height of 1.70m. There are no windows in this shed, so you may want to have an alternate light source available when using it. Inside, however, we found it refreshingly airy and cool, which is testament to the effectiveness of the air vents built into the gable. The siting of the doors inside the outer shell itself acts as a security feature, making it harder to remove them, as does the lack of windows. When we review metal sheds with window free designs we are always reminded of how effective a deterrent it can be, after all most opportune shed thieves will be looking for a target that they know will provide them with valuable items, not one that may well be empty if they break in. It was also good to see that the handles were holed in preparation for a padlock, although it would have been even better if a padlock itself had been included. The optional extra that we would most highly recommend is a padlock and alarm kit. 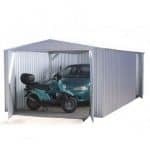 Available for just over twenty pounds, they greatly improve the security of the shed, and will give you added peace of mind if you want to store more valuable items inside such as a ride on lawnmower. The other extra that is a must buy is a set of Hilti screws which can be used to anchor the shed to a pre-existing concrete base, or alternatively onto a patio or paved area. Indeed, so essential are these items that we would have liked to see them included with the standard flat pack kit. The paintwork isn’t the only high quality element on display, as shown by the ease with which the parts fitted together and its strength and stability once assembled. We were pleased to see that a slightly thicker cladding had been used on this shed, although it remains lightweight. It was also good to see such a lengthy warranty against rust damage. Ridge and eave heights can make a big difference to small to mid size sheds, and we certainly appreciated the extra head room here. There are a lot of parts, and some of the metal sheeting can be sharp, so wear gloves, but the instructions are easy to follow. It took two of us around four hours to complete the installation. 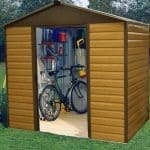 For such a well built shed in an original colour scheme, this is good value for money, although this could have been improved still further if an anchor kit and padlock had been included. Final Thoughts: This shed really is eye catching, and your neighbours and friends are sure to want to know where you bought it. Whilst the blue and cream paintwork is striking, however, it’s certainly not garish, and will complement a garden environment rather than standing out obtrusively. Once installed, we were impressed by how tough and solid it was, despite feeling light in its original flat pack form. The combination of hot dipped galvanised cladding and a galvanised apex roof should prove very effective at keeping rain and snow at bay, which is good news for you and your tools and equipment.